Brazilian protesters marching through the streets. Great use of the past simple of "to wake up"! I have been living in Rio for almost two decades now; I arrived a few years after Collar was successfully impeached (he actually resigned, but who's counting?) in a politically charged popular movement for his removal. It was a people's protest, under s single banner - that Collar get the hell out of office. That it was successful just goes to show what a popular movement, coupled with appropriate political processes, can achieve. Fast forward 20 years and you have today's protests. All I can say is that it's about time! 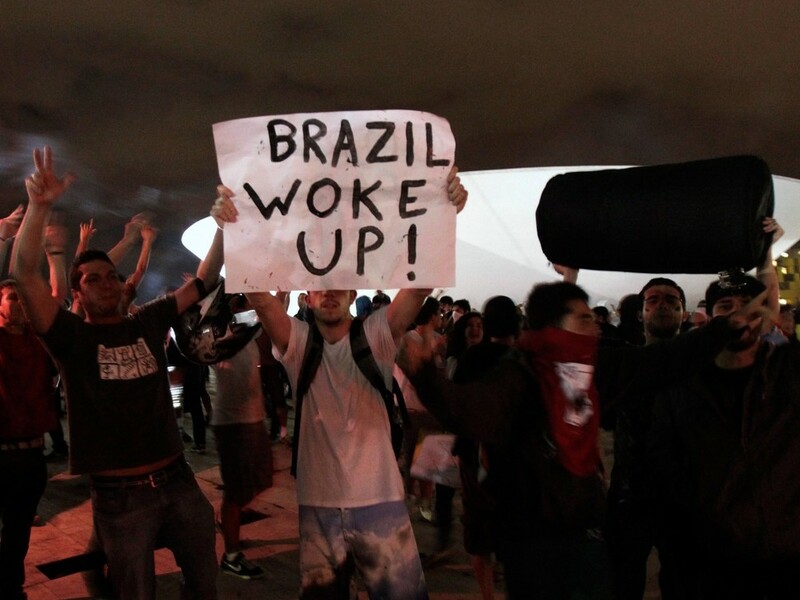 Brazil hadn't seen anything like it since the Collar impeachment, so no one should be surprised that the gears were a little rusty in the protesting department. But the training wheels have come off and Brazilians have seen what the power of a movement can do: scare politicians, sort of. I have to refer to one of the wittiest parodies of current Brazilian politics that I have ever seen, and my hat goes off to Porta dos Fundos for producing this savvy little gem. Turn on the subtitles in English and enjoy: "Reunião de Emergência"
That being said, however, there are, in my opinion, some serious problems the movement faces. First of all, unlike the Collar impeachment rallies, these protests lack a clear and concise purpose. It seems that everyone has their own agenda, from improvements to public education and health to lower taxes and better roads and bridges, to an end to political corruption. I personally want better public transportation (my livelihood depends on it). So many people have so much invested in so many often disparate things that the focus is lost on what's really most important for everybody. And what is that exactly? That's the other problem. They're ALL important! There's so much wrong, broken and failing in the system that no one knows really exactly where to begin treating the patient. A daunting task lies ahead, and maintaining a united front, peaceful and extended protests and thoughtful political candidate selection could represent a good first step in the right direction. We’ll see what happens in the coming months and in next year’s elections. You can bet the Brazilian people are more aware about their role when it comes to choosing politicians and supporting policy. At the end of the day, though, it’s a democracy, and it’s the people’s choice that dictates the future of the country politically and socially. I have high hopes, and even if I can’t cast my own vote (I’m a lowly resident and not a citizen! ), I’m still involving myself in the conversation and debate. It’s the least I can do.